Ever had a great idea only to learn that someone had already thought of it? I was pleasantly surprised when this puzzle was approved in February. It didn't seem likely that I would be the first to submit a Magna Carta theme when the year of its 800th anniversary was well under way, but I was lucky this time. I was asked to revise both the grid and the content so that it could appear on June 15, Magna Carta Day, a Monday. Two rewrites (and two "cheater squares") later, the puzzle was accepted. It then went through the editorial process: sixteen clues were unchanged but 28 were modified to varying degrees and 32 were new and improved, all in the spirit of greater Monday-friendliness. Nicholas Vincent, author of "Magna Carta: A Very Short Introduction," said that "John really was an absolute rotter through and through; the worst king in English history." Even A.A. Milne wrote "King John was not a good man," and Robin Hood had no respect for him according to Disney. To make John behave, he was forced by the barons to seal the "Great Charter," but as soon as he was away from Runnymede, he asked Pope Innocent III to have it annulled. The charter, later named Magna Carta, was pretty well ignored by everyone at the time and no English king was ever again named John. Here's something for physics buffs to ponder. 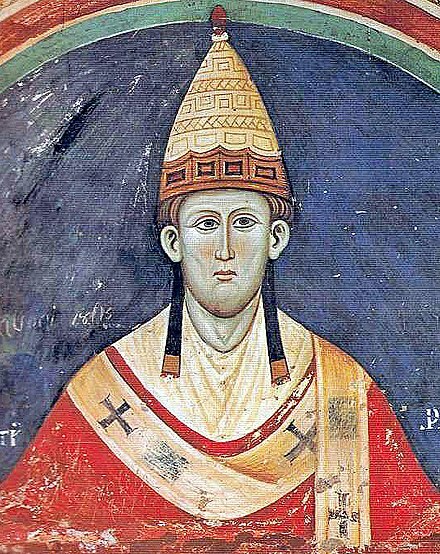 Living at the same time as Pope Innocent III was Antipope Innocent III. One wonders, had the pope and antipope ever met, would they have annihilated each other in a burst of photons and gluons? Hope you enjoyed the puzzle and are having a jolly good octocentenary. RUNNYMEDE isn't quite as interesting to me, as it doesn't have any trivia tidbits that go with it. I'm sure others will disagree. It is sort of cool how it interlocks into MAGNA CARTA and DUE PROCESS — never an easy task to achieve fortuitous interlock — but to me, the other themers had greater interest and impact. That interlock also puts huge constraints on the grid, forcing big corners in the grid and not allowing very many long pieces of fill. Mike does well in the lower left, with SOLOMON / SO THERE adding to the quality of the solve. Those two nice answers at the price of only ESSO (which is still a big brand up in Canada)? Yes please! And SAMOVAR and PICASA are pretty nice as well. In the lower right, I hitched on IN A SUIT. It takes up a precious 7-letter slot, and it felt arbitrary to me at first. Does that open the door for IN SLACKS, IN VELOUR, IN A THONG? Ultimately I decided I was being too picky though, as the phrase gets plenty of Google hits. ULRIC crossing RUNNYMEDE is likely to give some people fits. I think it's more fair than not, as RUNNYMEDE felt familiar-ish to me, but that won't stop some people from grumbling. Generally, it's a pretty clean puzzle, aside from a few RATER / AIRER things. I like to have all my gluey bits from different categories so they don't stand out as much, so it's too bad that these are both of the "add an -ER" variety. I really liked the clue for OEDS. Funny to think of having a magnifying glass included in the sale! Again, an interesting piece of trivia to learn. All in all, I liked the trivia. Those tidbits helped the puzzle stand out from other tribute puzzles.